At age thirty, Steve Biko was killed while in police custody. Before his demise he was known as a political activist and founder of the Black Consciousness Movement. But after his untimely death he became a symbol of heroic defiance against apartheid in South Africa. In his college days he wrote columns in the student journal under the pseudonym “Frank Talk”, which later became this book. There is biblical truth in this. Christians should seek unity with all races, because all Christians—regardless of skin color—will join the same choir one day (Rev. 5:9; 7:9). Scripture doesn’t tell blacks or whites to give up their cultural identity in order to appear like another race or people (1Co. 7:18-19). Let me make two points where Biko’s reasoning is flawed. Economically, I wonder how he can maintain the superiority of tribal land and the inferiority of private ownership and yet talk of “theft”. How can there be “theft” without private property? How can you say “our” land was stolen, if no one owns anything? And how does he determine to whom South Africa belongs? Those who were here at the creation of the world? Those who were here first? If the latter, then South Africa belongs to the Khoisan, whom the dominant Bantu of today’s South Africa displaced long ago. 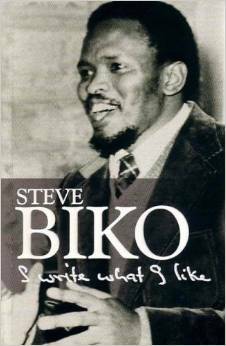 Biko also paints South Africa with utopian strokes, saying before the whites came, “poverty was a foreign concept”. History says otherwise. Biko’s attempt to use Black Theology to make Scripture relevant to the African is the problem, not the solution. Indeed, the Bible is relevant to Africans! But Biko, instead of pulling out those applications already in the text, removes those items that do not fit the worldview Africans currently possess. This is exactly what the Prosperity Gospel does today, leading Africans to hell by the millions. Biko denies hell and man’s depravity and espouses the inherent goodness of man. He blames the weakening of cultural values on missionaries and calls Christianity “cold and cruel.” As a missionary in South Africa, that struck me as inaccurate. No missionaries are perfect. If some were racist and refused to teach that all believers, regardless of race, are baptized by one Spirit into one body (1Co. 12:13), let history and Scripture pronounce them in error and sin. But I suspect that the vast majority of missionaries loved the blacks, leaving kin and country to show them Christ’s love, and should be lauded as the instruments God used to bring many of them to Christ. This entry was posted in Book Reviews and tagged 2015 Review, biography, historical by Paul Schlehlein. Bookmark the permalink.